The concept of the Feminine refers to wholeness and interconnectedness – the “cosmic web,” in contemporary terms. 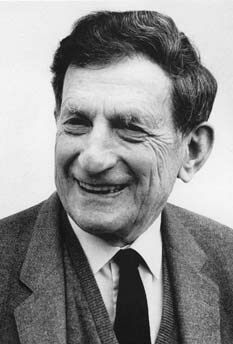 Professor David Bohm, from the Northwest Branch of The Theosophical Society website. Physicist David Bohm expressed this idea through the concepts of Implicate and Explicate Order. The Explicate Order – everything that we see in the known universe – “unfolded” from the Implicate Order, the world of unmanifest potential. To demonstrate this, Professor Bohm referred to a famous experiment at the Royal Institute in London, where a drop of ink was placed into a device consisting of two cylinders of glass, holding a fluid. When the device was turned, the drop of ink was pulled into the liquid and then disappeared. However, when the device was turned in reverse, the droplet reappeared. This demonstrates that there is an order that “doesn’t show” – the implicate order from whence everything we know is derived. Consciousness is much more of the implicate order than is matter . . . Yet at a deeper level [matter and consciousness] are actually inseparable and interwoven, just as in the computer game the player and the screen are united by participation.